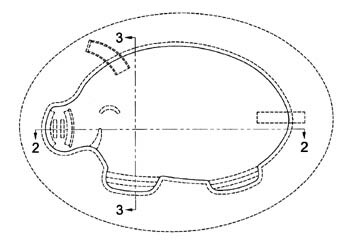 Patent #D490905 issued on June 1, 2004 for a Pig Swimming Pool. The ornamental design for a pig swimming pool. Marshmallow Peeps are a stable of Easter Baskets all over the country. This delicious or maybe disgusting candy is made from marshmallows, sugar, gelatin and caranauba wax. These sugary treats were brought to consumers on a large scale in 1954. But their story starts before that. It has always been tradition to light up the Christmas tree with some kind of lights. Despite the danger of fire, candles had been used to light up the Christmas tree. 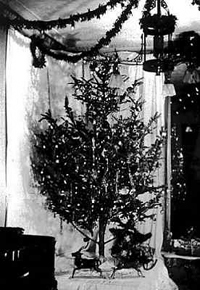 In 1882, Edward Johnson demonstrated a new way to light up the tree. Johnson created the first string of electric Christmas lights. He hand wired 80 red, white and blue light bulbs and strung them on his tree in New York City. 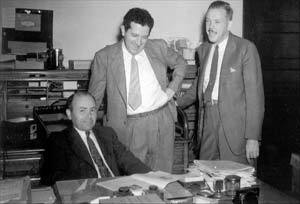 The event was reported by a visiting journalist from the Detroit Post and Tribune. “Last evening I walked over beyond Fifth Avenue and called at the residence of Edward H. Johnson, vice-president of Edison’s electric company. There, at the rear of the beautiful parlors, was a large Christmas tree presenting a most picturesque and uncanny aspect. It was brilliantly lighted with many colored globes about as large as an English walnut and was turning some six times a minute on a little pine box. There were eighty lights in all encased in these dainty glass eggs, and about equally divided between white, red and blue. As the tree turned, the colors alternated, all the lamps going out and being relit at every revolution. The result was a continuous twinkling of dancing colors, red, white, blue, white, red, blue—all evening. 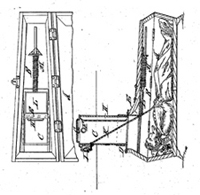 Patent #81,437 was issued to Franz Vester on August 25, 1868 for an Improved Burial Case. This coffin was designed so that a person who was buried alive could escape. Vester’s invention included a square tube that extended above the gravesite allowing air inside the coffin. This tube had a ladder and a way for above-ground onlookers to peek inside the coffin below. A bell and cord inside could be used by the occupant to let everyone know he was still alive.